《主に米国で用いられる》 懐中電灯 (《主に英国で用いられる》 (electric) torch). 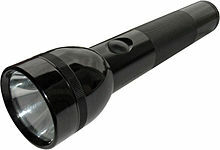 (US, Canada) A battery-powered hand-held light source. At school he used to do Dr. Jekyll turning into Mr. Hyde, shining a flashlight into his face. A flashgun (device used to create flashes of light for photography). He sat in an arm-chair with his forefinger to his temple, and when the photographer's flashlight went off, he hoped that the hotel had caught fire and that this would end it all. […] the flashlight exploded like a tiny bomb, making the Vicar jump a little, which explains why his face is a thankful blur, his deadly role forgotten to history (I have the photograph before me now). […] two or three bright flashlights went off close to us. It seemed that some prominent person was being quickly interviewed by reporters and photographed just before the ship left. (transitive) To illuminate with a flashlight. Autis stepped carefully while flashlighting the fog in front of himself and Gar.